I'm finally getting around to a recipe post that I've been wanting to write for over a year! I first saw this at a coffee house in Tucson Arizona, in April 2008, when I was out visiting my best friend, Rachel. Then I learned about using couscous as a breakfast cereal from Mark Bittman's book, Food Matters. During the interval of a year and a few months, I've continued to make couscous as I usually do, and occasionally, I've made it specifically for breakfast - omitting the savory spices, herbs and olive oil. I think I've even taken photos to use on the blog, but never got around to posting the recipe. Better late than never! Here's the thing though - the recipe can be whatever you want it to be. Readers of my posts know should know this by now, I present an idea, adapted from someone else's ideas and you can mush it around some more and make it your own. Nothing is as it has to be - just use what you have and adapt from there. Most of the time no two of my meals ever turn out the same; I like to mix it up. If you can find wholewheat couscous, use that - it's better for you since it's more of a whole unprocessed grain. You definitely want to use the regular couscous and not Israeli Couscous, the regular cooks faster. This dish reminds me of pastina, the Italian cereal for babies and children (and me, who still behaves like a child.) Pastina is a tiny grain that cooks quickly and is sort of star shaped. It's slightly denser than couscous which is more of a milled roughly formed semolina pasta whereas pastina is uniformly shaped and extruded. Buy unflavored couscous, in bulk from places like Whole Foods - it's far cheaper than the stuff in the box which will cost you more than 3x's the price for a cup. I find this recipe to be handy to make in advance, much like oatmeal, but tastier. Great pre-morning ride meal, or post recovery ride meal. Good carbs, some sugar, protein and good but low-fat (depending on what you add though.) When I've made this for a dinner side dish, I make it almost the same way, but I season it with salt and pepper, chopped fresh parsley and use olive oil as my fat. Naturally, I skip the sweetener and milk, though who knows, it might be good! Place uncooked couscous in a large heat-safe bowl. Add in a pinch of salt, the dried cranberries and diced dried apricots. Stir to combine and set aside. Bring 2 cups of water to a rapid boil. Pour 1 & 1/2 cups of hot boiling water over the couscous and dried fruit mixture and cover the bowl tightly with plastic wrap or with a tight fitting lid. Set aside and allow the couscous to absorb the hot water. If the couscous is too dry and isn't hydrated enough, use the remaining hot water and pour it over the mixture. 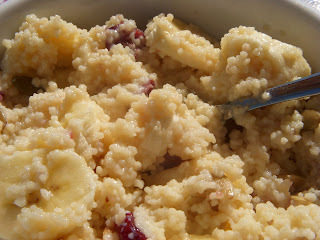 Once the couscous has absorbed all the water, fluff with a fork and gently stir to incorporate the now re-hydrated fruit. Add in the nuts and seeds, the orange zest, juice and segments. Fluff to combine. To serve as a breakfast cereal, the couscous should be hot. Add to it a 1/4 cup of hot skim milk for each portion and pour over the couscous. I added a sliced banana to my cereal and a bit of sugar just to sweeten it a bit, though with the fruit and orange, it may not be necessary. Wow, this is so interesting and different! thanks for sharing! You going to any games soon? I have tix for this Friday (Boston) and next Saturday (Baltimore) and am so excited!! Hi! Just saw your comment - how do I email you?? I need more info on this Hungry Girl, and your idea for the RF cheese nips is great! I'm in 304 on Friday.